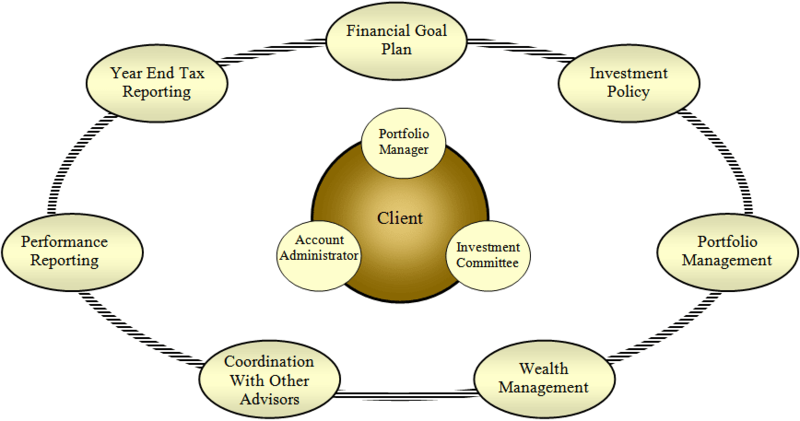 Every Kanawha client is assigned a specific portfolio manager. That manager is then entrusted with overseeing the day-to-day investment of your account and keeping you apprised of our latest view of the investment landscape. You are always encouraged to contact us, even with the slightest question or concern about your portfolio. Backing up the Kanawha portfolio manager is our full team of investment professionals that meet regularly to discuss current trends in the economic environment, the earnings progress of each of our equity holdings, and possible investment changes. The goal of this team approach is to leverage the entire firm’s expertise. We also believe in keeping you fully informed on the status of your investments. Quarterly appraisals are provided detailing portfolio holdings and investment results. Included with our quarterly mailing is a copy of our latest Investment Perspective which summarizes Kanawha’s thinking concerning trends in the economy and the financial markets. Kanawha Currents, our financial planning and wealth management oriented letter, is also sent to clients several times per year. This publication highlights a variety of more general topics in order to better educate our client base regarding their overall financial well-being. Additionally, we meet with clients personally throughout the year to review the portfolio’s progress. Phone calls and e-mail queries are encouraged. We are always available to speak or meet with you. Successful long term wealth planning involves careful coordination across clients’ many trusted advisors. Kanawha portfolio managers encourage a regular dialogue with tax, estate planning, and other client fiduciaries.